Let’s face it, business development is all about relationships. If you are courting a potential business client, there is no better way to get in the door than by knowing someone on the inside — ideally someone high up the chain of command. Some lawyers consider developing these relationships to be an art. As its name indicates, Relationship Science aims to make it more of a science. In its basic concept, Relationship Science (or RelSci as it calls itself) sounds similar to LinkedIn, insofar as it maps out your connections in order to help you discover ways to connect with people and companies outside your immediate network. But RelSci has far more powerful tools than LinkedIn for mapping and searching relationships and has far more information about prospects. On top of that, it claims to have far more of the people who matter than does LinkedIn — top executives and corporate counsel who are often reluctant to share their profiles publicly on LinkedIn. RelSci claims that its database includes more than 3 million high-level “decision makers” at public and private companies — and that nearly half of them are not on LinkedIn. It also claims to have a much deeper level of intelligence about the names in its database — which also includes more than 1 million organizations. It employs some 150 researchers who scrape public sources for all available information about a subject and who then curate that information into “research-grade” profiles. It includes every public company across the globe and a number of private companies. Increasingly, it also includes law firms. The idea of all this is to help you identify who you and your colleagues know within an organization so that you can get a foot in the door. It can be used to generate new business, to get more intelligence about a prospect, or even to strengthen existing relationships. It works by mapping your contacts and those of others in your firm against its database of people and companies. Its principal tool for doing this is something called Path Finder. Say you are at a firm with an interest in exploring a relationship with Company X. 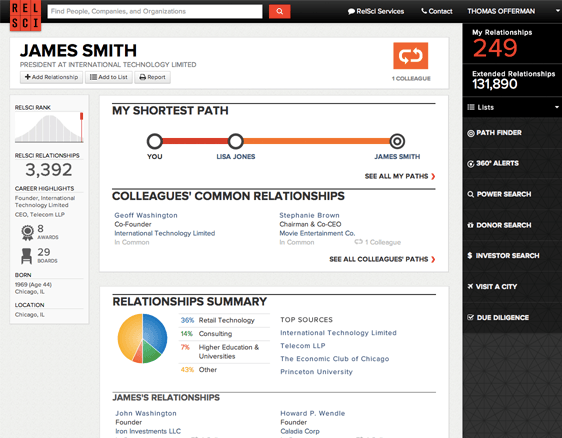 Search that company and Path Finder will map out how you are connected to that company. Maybe your contacts include someone within the company or maybe one of your partners has a contact there. You can find the strongest pathway and then follow it. RelSci also has a Power Search feature that includes an array of advanced search filters. Search by industry, interests, work history, education, investments, political contributions, nonprofit donations, memberships and other parameters. The level of information available here is much deeper than you could find through LinkedIn. Worth noting is that RelSci can also be used to map external relationships. Use it, for example, to find out which law firms already represent a company or which companies a law firm or lawyer represents (to the extent this information is available through public filings). Another feature, 360 Alerts, provides daily alerts by email when people and companies you know are mentioned in the news. 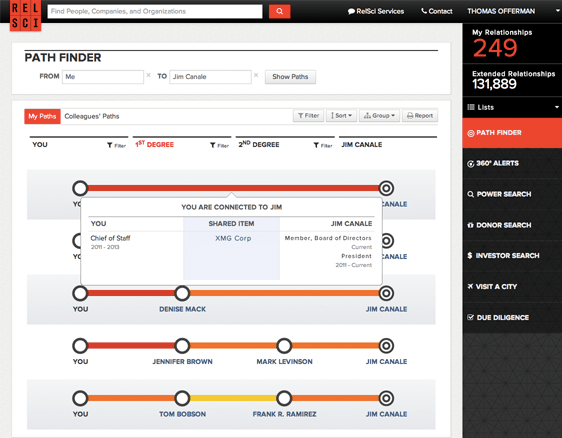 You can customize these to build specific lists of people and companies. You can also customize these to alert you only for specified events, such as when someone changes employment. One other feature worth noting is Visit a City. As its name suggests, use it in advance of your next business trip to research who you could or should meet with. When it launched last year, RelSci’s initial focus was on the financial services market. Over the last six months, it has made a greater push into the legal industry. It counts several AmLaw 100 firms among its subscribers. Within firms, it would be useful for those who work in business development and marketing for research and prospecting as well as for partners and associates who are involved in rainmaking. An individual subscription to RelSci is $3,000 a year. Enterprise subscriptions are available at more favorable per-user prices.